» Stamp Simply Celebrates! Day 1 – Blog Candy and More! Hi everyone!!! So glad you are stopping in — we have SO much lined up over the next 12 days. The schedule is full and we welcome you all to take a peek. Thecomplete schedule which we are calling PARTY CENTRAL is located at the TAB above my BLOG BANNER — look way UP — click there and you will see our full schedule of events for the next 12 days. You can refer there at any time. Right now all links lead to the Blog URL’s — but as the scheduled posts go live daily, the links will be changed appropriately.Once at Party Central,please take a moment to read about our KEYWORD for SCS uploads(SSC08) and our Rules of Blog Candy Netiquette. Thanks so much! Anyone can play ANY of the challenges by ANY of the hostesses during our 12 days of Stamp Simply Celebrates!!! You DO NOT have to have a Blog to play — uploading your project to SCS (Splitcoaststampers.com) is not only permissible, but HIGHLY ENCOURAGED. When doing so, use the KEYWORD SSC08. Thanks! The main attraction today to get us started is over at Janine’s Blog, 2bKrafty. Janine’s creativity on this one was way over the top — be sure to check it out — it involvesher lovely Featured Project, a Challenge, AND Blog Candy!!! In addition to Janine, above, the following girls have some GREAT Cookies, recipes and packaging to share with you: Jennifer, Darlene, Deb, AJ, Barb, Jerri, LeAnne. 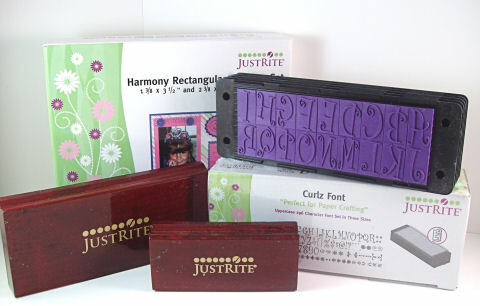 The winner of today’s Blog Candy will receive, direct from JustRite, the Curlz FontEnsemble which contains 3 different sizes of font in handy stackable storage trays, plus the Harmony Rectangle Stampers. They come 2 in a box, one large and one small, as shown in the photo above. To be eligible to win, merely leave a comment on this post telling me what it is about the JustRite product that MOST appeals to you — for example, the ability to do monograms, the snap in grids, the comfortable to hold wood stampers, the variety of font available, etc., etc. Inquiring minds like to know — LOL!!! This Blog Candy post is closed for entries at 6:00 p.m. EST on Saturday, Dec 6. Shortly after 6:00 a winner will be selected by random.org. The winner will be posted both on this thread and at PARTY CENTRAL. I made this bag easily with my Scor-It, using SU Holiday Treasures DP, the Baking Ensemble by JustRite for the heart shaped focal image, Curlz Font by JustRite for my name tag, and some 1.5″ wide ribbon and some baby rick rack. I used my Petite Circle Nestabilities to cut, emboss and frame the focal image and a Tags die, also by Spellbinders, for the name tag. A SU 1 1/4″ punch was used on the bag to form the handle. A tiny gold safety pin holds the tag on the ribbon. SU Riding Hood Red ink was used. If dough is dry, add 1 2 Tbs. cream. Wrap level Tbs. of dough around filling. Place 1 apart on ungreased baking sheet and bake until set, but not brown in a 350 degree oven (12 15 min). Filling possibilities: Well-drained maraschino cherries, pitted dates, gumdrops, or tsp. mixture of 1 sq. unsweetened chocolate, melted, and cup shredded coconut. Icing: 1 cup sifted confectioners sugar, 2 Tbs. cream, 1 tsp. vanilla, food coloring, if desired. On this box/bag there is NO cutting or slitting to make tabs. It is all just in the way it is folded. I got this template from the 3-D Design Challenge Blog. This project was called the One Sheet Box Challenge and here’s the link to their One Sheet Box Folding Video. Please check these links as it’ll make it clear. It’s a bit confusing at first, but once you see it and do it, it’s as easy as pie and makes total sense. That’s it from me for Day 1. Be sure to run over to Janine’s if you haven’t been there yet — she’ll have a ton of links for you to check out many great Cookie Recipe Exchange projects!!! Thanks so much for coming!!! Hope to see you all again tomorrow!!! Sara – Congrats on all of the hits!! Those cookies look so YUMMY!! I think its cool that they have the larger size fonts, most stamps are the smaller sizes but sometimes you just really need the bigger sizes. Thank you ALL so much for playing — MUCH APPRECIATED!!! oh yea! LOVE your cookies- they look fabulous! yum!! and that bag is adorable! Wow! This does look to be an exciting 12 days! As for what I like most about JustRite products, it’s the flexibility to CUSTOMIZE EVERYTHING! I love that I can choose what I say, how I say it and how I embellish it from font to frames. Just FANTASTIC! Thanks for the chance to win…and for sharing yet another wonderful project! Congrats Sharon on your blogging achievement! I love to pop in everyday and see what you’ve been up to! I love the snap in feature of the JustRite stamps – it really bugs me trying to line up individual letter stamps and getting them to stamp in a straight line. I’m all for making life easier! Great gift idea! Yummy cookies, wish I had 1 right now! What I like about the JustRite stamps is the ability to personalize a project, especially if I’m giving it as a gift. My family loved that I made my own napkin rings with their names on them…they were very impressed & I took it all in of course! Thanks for offering up some great candy! The cookies are making my mouth water! I love the ability to do monograms with a variety of decorative edges. Thanks for the chance to win some of these. I love JustRite products because of the ease of personalizing cards/gifts. In fact, I made a card for my aunt today so she could send a personalized 40th birthday card. Too cool! Thanks for continuing to share your talent with us! I have never tried Just Rite but I am intrigued by the lock in grid idea. I have been watching the blogs and keep looking……….LOL. Blogville is soooooo enabling! Thanks for the chance to win, and congrats for over 1 million visits. I am drawn to circle stamps, and these are great because you can interchange everything. Even with just one set, you can obtain so many different looks. I had a chance to play with a set about 2 weeks ago, and look forward to using them more. Your cookies look so yummy. Can’t wait to get all the recipes. I love the Just Rite stamps because they are the most versatile stamps I own. I can make any phrase I want and I can easily personalize any gift. I have the original stamper so this would be a wonderful addition! great blog post. The cookies look very yummy. I like Just Rite stampers because of the ability to monogram with them. I don’t have to worry about lining up the letters. Hi Sharon! Those cookies look delicious! What a fun presentation—thanks for the tutorial on the bag! 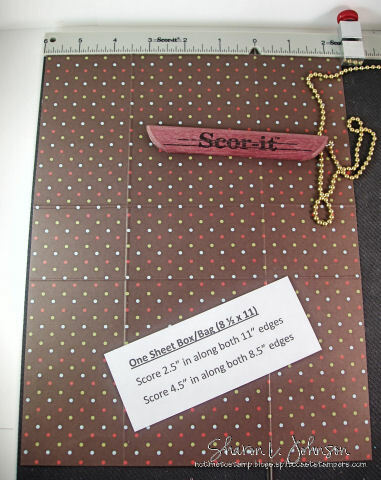 I think these Just Rite products are perfect for making monograms…how awesome! Thanks for the opportunity to win this great blog candy! I love your blog! With the JustRite stampers, it is the attraction of the monograms for me right now. Thanks for the chance to win the blog candy! Really fun! A lovely way to present your goodies!! I must say how YUMMY your Bon Bons look!! No need to enter me in the candy, Sharon, as I do already own these, and would hate for someone else not to get these awesome stampers!! I will tell you though, why I love them so much…they are so innovative with their lock in grids, and they are soooo versatile! I can customize my stamps to exactly what I want with any of their wonderful fonts! Thanks for the chance at blog candy! What a great prize. I have my first set of JustRite stamps coming soon, but I have played with a set and love the fact that they do monograms. Cute, cute bag and yummy looking cookies!!! As far as the JustRite goes–I have enjoyed the ease of use — with my experience very brief using the Christmas and baking stamp sets. WOW! i LOVE JUST RITE STAMPERS BECAUSE OF THE EASE OF PERSONALIZING AND TO SAY WHATEVER MY HEART’S DESIRE!!! LOVE YOUR BLOG!!!! The cookies look so good! Love your projects. I really like JustRite cuz you can use them for anything. Tags, scrapbooks, cards, and even magnets to name a few. I don’t own one yet, but I do have them on my very long wishlist. Maybe this will be my lucky day and I will win this one. Thanks for a chance. I have several of the Just Rite sets and really like them for the way the grids hold the stamps so securely. I’ve recently ordered the Kitchen Set for my Secret Stamper for her Christmas gift. Thanks for the chance to win a set that’s new to me. Your blog is awesome!! Great bag, and your cookies look so yummy. I have never tried Just Rite stamps, but love the idea of being able to make monograms. Thank you for the chance to win some Just Rite stamps. I just recently purchased the Just Rite monogram set and I love that I will be able to use it to customize gifts for the hoidays. Just a simple box of cards with each recipients initial on the front will be an inexpensive yet extremely useful gift. Can’t wait to get started stamping! Both the bag and the goodies look completely yummy! I have a cookie swap/ stamp get together this Friday and those look so festive I may have to give them a try! My favorite thing about Just Rite stamps is the personalization. I can make beautiful personalized gifts that look professional in no time with these awesome products! Thanks for this awesome opportunity! Take care! I am definitely going to try those cookies – they look really yummy!! I love my Monogram C45 from Just Rite – it allows me to personalize anything however I want to! I also have fallen in love with the large oval set. I love how it sets off my cards! Thanks for a week of upcoming fun! Great to celebrate w you! It’s a tie for me – I love the Christmas and Baking ensembles, and the Brayton font sets. I did crafts w my boys today – looks like I should’ve been busy baking; maybe tomorrow! TFS! Your projects are so adorable, and those cookies look divine! What a wonderful gift to have those childhood memories with your Mom. Thanks so much for hosting such a great party week! Love those JustRite stampers! What cute ideas. I don’t have any Justrite yet but I am so impressed by the verstility and the way you can spell out exactly what word you want. Maybe I will be the lucky one for the blog candy. Here’s hoping. And congratulations, Sharon. It should be a fun celebration. What a fun party, Sharon! I have yet to try any JustRite products, but what intrigues me the most about them is the ability to make my letters STRAIGHT! I cannot stamp in a straight line to save my life! Thanks for the chance to win! I would so love to win this awesome Just Rite gift!!! I love the sooo many choices and the ease of all of the Just Rite sets!!! I am a total tag addict and will put them on anything! I soooo hope that I get to win!!! CONGRATS again on reaching one million hits!! WOWZA!! The thing I like most about the JustRite products is their distinctive look. I am all about monograms and JR rocks the monogram thingy big time!! Can’t wait to see what you share next! XOXOX your FAB blog!!!! Cheers to your next million hits! Fun! What a fabulous way to celebrate Christmas in Blogville! I can’t wait to see what all you have to share with us! This bag is adorable, right down to the ric rac and safety pin! Perfect for those cookies. You are such an inspiration to me and all who visit! Congratulations my friend! Let the party begin! You have so many beautiful creations! What I love about the Just Rite stamps is that there are so many things you can do with them, tags, cards, decorations, invitations… just about anything you can think of. Yum, those cookies look tasty! Congratulations! I enjoy learning through your blog so thanks for sharing with all of us. I have the small monogram stamper and have used it to create many card sets to give as gifts. So, I guess the ablility to create lovely gifts easily would be my favorite thing about JustRite stamps. Those look like yummy cookies — thanks for the recipe and the picture. The versatility of the JR stampers appeals to me, as well as the simplicity of the designs. I love your bag, it is just in time for Christmas. I will be sure to try it for some of my smaller gifts. Thanks for the chance at the blog candy! A big, huge congrats to you on your awesome blog count of 1,000,000 hits! Wow!! Love your cookie treat bag, thanks for the instructions to make them. Will be making a few of those myself :D.
Hmmm, I like a lot of things about the JustRite stampers, everything that you mentioned above, but the two things I like the very most are the ability to make any sentiment stamps I need or want (very important) and being able to personalize the projects that I make. I don’t know how many times I have wanted a particular sentiment and no stamp that says it :(. The rectangle and oval stampers are on my wishlist to get… hopefully I will get them from my Hubby for Christmas :D.
Congrats again on your amazing hits count and many best wishes until you reach the next 1,000,000 hits! Thank you for the opportunity to win a set of the rectangle stampers! OMG what amazing Blog candy…I think these sets are so clever. Versatile, pretty and love that you can create your own words and greetings. The person who created these is a genius. I would LOVE to win this candy…and i don’t even usually enter to win as I never win anything in draws..LOL. Crossing my fingers and toes for this one! I LOVE the monograms with the pretty borders – that’s the best thing about Just Rite, I think, maybe. There are so many possiblities with these stamps, it’s hard to say what’s best. Oh yeah, best would be if I won!!!! Thanks, Sharon, for sharing all these wonderful projects with us. We have seen some amazing works of art on your blog and now some yummy holiday cookies too! Thanks for giving up so much of your time providing us with instructions and photos of your creations that are so helpful. I think the JustRite products are great for adding the personal touch to any project and make lining up words a snap. Have a great day. I LOVE the monograms but what I like best is being able to use different fonts and create my own sayings. Of course I can do this w/regular unmounted stamps but they always come out crooked.That’s not a problem w/these stamps. Your cookies look delish! I already know which cookies I am going to make! After this post, I will write the ingredients on my grocery list! The feature that most appeals to me about Just Rite products are being able to stamp whatever phrase appeals to you (the personalization factor)! I want to make your cookie- I love cherries! This is a must try recipe. The little gift bag is just too cute. I love to be able to personalize projects but using regular alpha sets is a real pain, that is why I want to try Just Right Stamps. Thanks for the chance to win. Love that cookie bag! Thanks for the links on how to make it. I like Just Rite because everything made with them is so neat and precise. They appeal to my virgo nature. My mom has made cookies like that for years but puts a few chocolate chips inside. Same name, same pink icing. Small world. I love the letters aligning perfectly straight. I just bought my first monogram set today. I can’t wait to get my own set, winning this would be fabulous. I think the ability to combine different fonts easily to stamp different saying at will on blocks with great grips and grids is why I most like JR.
Ooooooooooo Sharon, what an adorable bag and recipe – thank you muchly for sharing. I was fortunate enough to “find” a basic Justrite monogram stamping kit from a UK seller a few weeks back and it’s as wonderful as I thought it would be. Just wish all the “whistles and bells” Justrite make were available over here too! What I love about JustRite are the stamps that let you interchange the center and the border – talk about customizable! woweee! Thanks so much for offering such wonderful candy! I love it for monograms. Both of my daughters are forever asking me to whip up a pack of monogrammed cards so they can give a gift to one of their friends. With the JustRite, it couldn’t be easier! Oh I am so excited. Love the way you made the bag. My favorite thing about JustRite is the rectangular stamper. Such versatility, some many things you can do with this. It`s like creating your own stamp. I love the fact that you can do so much with even one set. The different size fonts, the different centers on the circles. I haven’t gotten any yet because I just can’t choose. I have them on my Christmas list for Santa. If he doesn’t bring them I guess I will have to order some after the holidays. I love the fact that you can monogram anything. Your cookies look delicious! Thanks for the chance to win the blog candy! It’s great. All this and recipes, too! Love your blog. The cookies look yummy!! I especially like Justrite’s monograms with borders! The fact that they fit so nicely inside the circle nestabilities is “icing on the cookies”! Oh your cookies bring back memories! Just purchased the monogram fonts and am looking forward [should I say eagerly] to using them and getting good at it. Congrats on a wonderful blog! Thanks for the gift bag tutorial and yummy recipe too. I have yet to see any Just Rite products over here in Australia, but have seen them used on many US blogs…..the thing that attracts me most is being able to lock in the letters and stamp in a straight line! Hey Sharon!! What a great start to the week!! Yummy looking cookies and great bag!!! Thanks for the chance at the awesome candy!! What do I like about JustRite – I like the monograms but I also like that you can change things up with your stamps to make different combinations!! Congratulations on going over a million on your blog! I love the JustRite stamps/system because it is so easy to create personalized cards. It is virtually impossible for even me to make a mistake! Really coming in handy since I am working on wedding invitations for my daughter right now. I love JustRite products. I’ve wanted a set ever since I first saw them used for the ease of personalizing my cards and projects. The system looks so easy to use and everything is interchangable. I love that I can spell out any verse or phrase and not have to buy a seperate stamp for each one. I can buy different fonts also. Love the cookie bag! MMMMM…yummy cookies and yummy projects too….thanks for a chance to win some great ‘candy’. Great Candy! Thanks for the chance. Those cookies look delicious! I do not own any Just-rite yet, but it is on my wish list for the monograms. That cookie bag is adorable! What a cute cookie bag, Sharon! The cookies look yummy, too! Thanks for the tutorial for the bag and the recipe for the cookies! I only have a couple of JustRite sets so far, but I definitely want to get more. The thing I love about them is how easy they are to use and how versatile for customizing my projects! Thanks for the chance to win the awesome JustRite sets! These cookies look yummy! I don’t have any Just Rite sets yet, but they look really cool! I’ve been thinking the monograms would be great when we start preparing for my daughter’s wedding, ( at least a year away). I just have visions of all of the stationary for the entire event having that monogram look to it. Congrats on your million hits (and then some by this time)! One of the things I like about the JustRite monogrammer is the two-color inkpads. When making monograms — or whatever — I like having the border a different color than the initial. I can’t wait to see all the creative projects! I love the use of monograms that Just Rite gives you. People just love the personalization on their gifts! the versatility of these stamps is amazing. would love to own the giveaways. thanks so much for sharing. Cute project! The best thing about JustRite stamps is the ability to customize your message, whether it is monograms or a saying, but I also like the snap in grid for the nice, neat look it gives you without a lot of hassle. I recently bought my first Just Rite set . . . and promptly bought another! I love the versatility of making my own words and sayings without worrying if the letters are straight. Everything lines of perfectly! Awesome! Happy Holidays! I like the idea of customizing too! I typically just do monograms, but hope to branch out with this product!! Thanks for sharing all that you do! MMMM cookies – they look so yummy! I have been eyeing those rectangle stampers since they come out. The versatility of being able to create your own saying for any card is extremely appealing! I love the ideal of you can customize them for English or Spanish and the double pad for different colors that really tocks. I look forward to read your blog every day.Thanks for sharing all your Ideas. Congrats Sharon! There are many aspects of JRS that I like, but the best, for me, is the ability to say exactly what I want to to that one specific person. How wonderful for someone to receive a card which was made for them and no one else! I think the presentation is professional-looking. There are just so many ideas to choose from, though! Your bag is the cutest. I love your blog, and you definitely have a talent for doing tutorials! I’m so happy for all those hits, & for this marker in your career! Like most other comments I read, I like the versatility of the JRS to personalize whatever project I am making. Thank you for the great blog candy! I have the round monogram stamper with the several sizes of letters, including the tiny alphabet. I love the fact that I can spell out anything I want around the border to make customizable accents for my cards and scrapbooks. I have made some truly original things for my scrapbooks that I would NEVER be able to find in a store. Yummy cookies! Thanks for the great kick-off and opportunity to win. I love the monograms since personalized gifts are just extra special – made just for that person so they know you were thinking only of them when you made it. Sweet! Party Time!! Let the fun begin and what a neat project to begin with and yummy cookies. May have to try that recipe! Love your bag and your cookies look delicious. I don’t have any Justrite products, but would love to win some to try them all. The idea of getting perfect letters/monograms really appeals to me. Congratulations on your blog history! That is awesome! I’m looking forward to partying. I saw some of the Just Rite line at Stamping in the Up. I was hooked then! I love them for the monograms, but love the fact you can use them in so many ways!! Your cookies look delicious and I love your bag! I love the idea of personalizing any gift with the Justrite Monograms. I don’t have any yet, but they are on my Christmas wish list. Just came across your blog recently, and am so INSPIRED!! I am new to JustRite stamps, and have just ordered a set for myself and my neice (who shares my addiciton to stamping and creating). I can’t wait to get my new goodies!! I want to monogram everything!!! Thanks for sharing all of your creations!!! I love the personalization factor with this but they haven’t come to my house yet. The cookies look great. I found a few of those cooking booklets while cleaning Mom’s house. I remember tiny sandwich cookies with pink or mint green filling.I’m going to make those bags to put my cookies in to share with neighbors. what a pretty little bag and those cookies look yum-o!! as for justrite products, i’ve yet to use them but i really WANT to because they seem so easy to use and line up so you don’t have crooked words! Hi Sharon: I just got my first three sets of just rite and I love the interchangable parts that I can mix and match, I love that they don’t take up any room to store compared to a wood mounted set too! Thanks for the chance at some blog candy that I don’t have yet that is already on my wish list! I love the fact that you can personalize everything with the Just Rite sets. It makes gift giving so much better and people love seeing their name or initials on a card or package. The idea was genius! Once again, you are amazing! I love the versatility of the Just Rite “program” as you can create any saying that you want…toooo cool! I especially love the cards you shared with scripture…..you can virtually make a card with any scripture…..awesome!!!! The cookies do also look yummy…wish I had a few for breakfast today…:) Would love to win the blog candy…thanks for a totally awesome, inspiring blog…all the time. Looking forward to the next 11 days. I would love the just rite sets. The cookies are mouth watering. i might just have to try making those cookies today – my girls would love cookies with surprises in the middle! i love this JustRite font – their products are so cool ðŸ™‚ thanks and merry Christmas! What a fun and exciting celebration, Sharon! 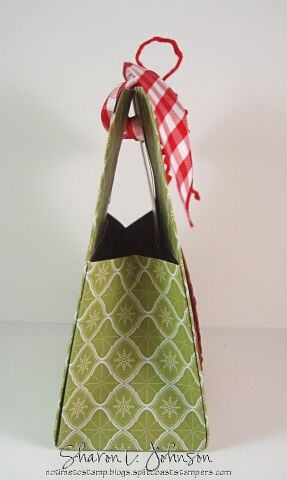 I love your cookie bag — just perfect for those holiday treats! I recently purchased my first JustRite products, and I love that there are so many options for fonts, borders, and messages! What a generous giveaway — thanks for the opportunity to win! Hi, I hope I have time to try your cookie recipe. It’s looks wonderful! I would love to win the blog candy also. I love my justrite stamps for their versatility. I use them for monograms and other gift items. I love the little cookie box! Gonna try that today. Although I have never tried any Just Rite products, the look intriguing…maybe this will be my chance to see what is great about them! Oh Sharon, this is too too cute!! You are the box-making queen of paper crafts!! This is just adorable and TFS what looks like a fantastic cookie recipe! Cherries – YUM!! Awesome!!! Those cookies look yummy! I just love the grid on JustRite Stamps, it makes it so easy to line up the monogram letters and add a little something around the outside. Lovely projects, Sharon. I like how you can make your own wording with JustRite. And the different borders that are possible too. Totally different. Thanks for a chance to win. Well – I’m so new to stamping that I’ve never used these types of stamps but sure would be willing to try them out – something tells me I would love them. Your cookies look great, Just Rite stamp are right on time for me I love that I can do monograms, I’ve made 44 Christmas projects with them. Congrats on hitting the 1,000,000 mark! With all your great projects, it’s no wonder. As far as the Just Rite products, I absolutely love how you can personalize anything…be it monograms or a sentiment of your own. The interchangeability does it for me. I’ve also enjoyed the great sets for making great and quick holiday gifts. Thanks so much for all the inspiration you provide. Love the way we can personalize any creation with JustRite stamps. That’s the real reason we create instead of buy, right? wow, very nice nice and congrats. These look delicious–very festive!!! And your packaging makes them even more delish! This would be an awesome early Christmas present. What I love about these stamps is the ability to create your own message. They haven’t been in my budget yet, so I would really love to win! Oh my gosh, those cookies look fabulous Sharon! Love the adorable box as well, perfect the holiday season! Thanks for sharing, yikes, I’m getting hungry from looking at all these fabulous cookies! Lovely ideas….great cookies…must try those when I convert your ‘cups’ to ounces here in UK. Now Just Rite….I’ve been admiring from afar and have just ordered a set today….borders…they attract me as it is so difficult to write or decorate in the round. Even though I am a calligrapher why would I put myself to this trouble when Just Rite have done it all for me….and everyone! Sharon, I always enjoy your blog entries, but I’m especially looking forward to these next 12 days. As for the JustRite products, I think they look wonderful, but I don’t have any yet. They’re on my wish list because I would like to make some of those great monograms! I loke the choices that the justrite stamps lgive you. Those bob bons look good!!!!!!!!!!!!!!!!!!!!!! I love JustRite stamps because it is so quick and easy to make beautiful monogrammed cards with anything you want on them. I have a long list of JustRite stamps on my Christmas wishlist. This is a great giveaway. Thanks for giving us a chance to win. I do not have any Just Rite products but I like the monogram capabilities. Congrats on all of the hits!! Those cookies look so YUMMY!! I think it’s cool that they have the larger size fonts, most stamps are the smaller sizes but sometimes you just really need the bigger sizes. Wow, I love this cookie exchange idea. It gets you in the holiday spirit. I love the packaging on your cookies. I just ordered the bake set and can’t wait to receive it. My favorite thing about Just Rite is the ability to make up my own words and phrases to put on the cards. I used to have to pring them out on the computer and was reluctant to just run the card through knowing that it might not show up exactly where I wanted it. Now I can stamp phrases wherever I want them. Genious! Happy Blogaversary. I am a “newbie” to Just Rite stamps. 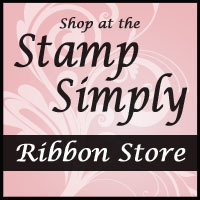 As a Stampin’ Up demonstrator, I thought I had to spend all my money on SU. Then I found Just Rite, met Sharon Johnson at CHA show in Chicago, and now I can’t stay off this site and I LUV my monogram stamps. I am looking forward to many more of these. I’ve never used Just Rite products. My sister did buy some but I have not had a chance to use any of hers yet. Ever since I have seen projects popping up all over the place with the Just Rite stamps, I have been wanting to try them. Thanks for the chance to win! I would love to have Just Rite products just to have the ability to write longer words, phrases and verses to really personalize projects. Enjoy your special week! Congrats! What a beautiful gift bag! Looks like something straight out of one of those fancy stationery stores. Just fabulous! Love the bag and the recipe! Gotta try that one! I love the fact that you don’t have to think when use the JR stamps. Just pop’em in and go! Letters are always straight!! Versatility! That is my favorite part of the Just Rite stamps. I love being able to personalize a gift. It has such a “WOW” factor associated with it. I have used my circle stamper for many different projects and would love to add the rectangular stamper to my growing collection of Just Rite stamps. Thanks! I love the fact that you can personalize just about everything with JustRite stamps. Thanks. I love being able to personalize gifts with the Just Rite sets. Your cookie recipe sounds delicious! I think for me the thing I like about Just Rite is that you have the ability to change the letters or words. Not like any other stamp where you have what you have. With JUst Rite, you can alter the stamp however you need to, to fit your project. I think they are awesome. Those bon bons look delicious, thanks for sharing the recipe and the recipe for the bag to put them in, I think that is a fantastic little gift. I don’t have any JustRite stamps…but I think that I would like to be able to personalize gifts and my own stuff. I am not familiar with the Just Rite stampers . Haven’t seen them in this area.I would love that they snap in and stay put. They sound great to work with so I will keep a look out for them in my stamp stores I go to. Would love to get to try them soon. I’ve never heard of these stamps :(. Just the fact that you can line them up straight would make them a winner in my book! the variety of fonts is what appeals to me most about Just Rite. they are gorgeous!!! Great idea. Thanks for the details. What appeals to me about JustRite products is the ability to customize everything! It makes it so much more appealing. Congrats on your blog! Enjoy looking at all your entries : ) Great inspiration! For JustRite products, I think it’s great that you can personalize a project any way you want. Possibilities are endless! Thanks for the chance to win! What a great blog candy giveaway! I have never used or owned one of these but would love to have one. I like the idea of the lock in grid and easy storage. Congrats on your hits, WOW!! Your little gift bag is adorable and the cookies look soooo good. YUM!! I don’t have any Justrite products yet, but I love how you can monogram with them. The ideas are endless! I have seen so many different uses of the JUST RITE stamps, it is so great to be able to personalize projects! thanks for offereing the blog candy! I LOVE the snap-in grids – and the ability to do monograms. Whenever I try to assemble words or dates or monograms by hand with acrylic blocks or regular stamps, it fails miserably. The snap-in grids keep the letters in place perfectly, and they’re spaced perfectly every time. I can’t even imagine doing that with tiny little letters on acrylic blocks. (Well, I tried and the result wasn’t pretty :-)). I have the original Just-Rite stamper and would LOVE the rectangle blocks and Curlz font!!! I do not presently have any of the JustRite stamps (what a great time for me to win!) but I just love the clean look of all the projects I have seen made with these stamps. Love your blog and your work is spectacular! Have a wonderful day! Congratulations for your blog. Your cookies look so yummy. What I like about Just Rite stamps is their versatility. Thanks for a chance to win this wonderful blog candy. Congrats on your amazing number of hits! Although it doesn’t surprise me at all!! Well done for you! The best thing about the JR stamps are the monograms!! Just love that! I just purchased my first monogram sets and love them! I think monogram note cards and adding a personalized touch to baked goods make great gifts. Great ideas and thanks for a chance to win some great Blog Candy. I love that JustRight allows you to say what you want and use different fonts to do it. I currently don’t own any, so the chance to win sounds great to me. I have had my eye on them for while and just have not been able to decide which would be best to start with. FYI: ohh those cookies look sooo good! Sharon, love the look of your cookies and thanks for sharing the recipe-neat that you have the original cookbook! The versatility of the stampers appeal to me. Would love to have the baking set, one I would use a lot. Congrats on all the hits and what a fun way to celebrate. Thanks for the chance to win Justrite products, and congratulations! I like that you can customize cards, gifts, etc with the monograms or different tags and sayings. The blog candy is awesome!!! I do not have any JustRite stamps yet. I do love the way you can use the stamps and make the images of words the way you want them. You can personalize your cards and art work that way. I am hoping to get some JustRite for Christmas or right after. Maybe I’ll win some too!!! ðŸ˜‰ Thanks for the chance to win some!!! Oh my word! Those cookies look like a “must do” on the Christmas list…..and the blog candy looks great as well! Being able to use your own words opens so many “idea” doors!!! Thanks for starting our Christmas Season off right! Thanks for the great recipie idea. I have so admired Just Rite sets since they first came out. I would love a set to make gifts for folks. But I haven’t been able to justify the expense of a new stamp set for teacher gifts. (My family doesn’t like hand made gifts from adults). Though with the versitility I have seen on blogs lately, perhaps I *need* them more than I thought. I am fairly new to your blog (where have I been?) Really love your work and congrats on your million blogs…..You cookies look wonderful and I am going to give the recipe to my granddaughter (she bakes). The JustRite stamps are great. I have a small set that I had kind of tucked away and have just recently revived….I love it and am planning on purchasing more….thanks for sharing…. I would love, love, love to win this candy! That’s the next thing on my list to purchase. I like that you can make your own sentiments and the different sizes of fonts available in a set. I only have the round stamper so far, and it’s fun to use. I love that you never need to find ‘just the right stamp’ to say what you want — you can do it yourself! Love the different font sizes in one style and that you can create different words easily with the slotted wooden block. Those cookies look yummy! I think my girls and I will have to bake some this week. I don’t have any JustRite products yet, but I think what appeals to me is the ability to create my own sentiment in a cute font. Also the letters look like they can be space evenly (hard for me to do with my other letter stamps). I don’t know what I like about JustRite stamps because I have never tried them but I would sure like to. I love the elegant look they produce when I see samples of the monogram stamps and they seem easy to use. I LOVE the versatility of the stamps because they can be personalized. I would love to win this blog candy!! Thanks for the cookie recipe. I haven’t used the Just rite stamps I bought over the weekend but am looking forward to the “snap in grid” to align my letters – I really like things lined up straight. Thanks for all you do Sharon – you have a great site. Congrats on 1 million hits ðŸ™‚ I remember when you first showed up on SCS and I drooled over your creations. Thanks for putting together a blog so we can enjoy even more! I haven’t used any Just Right products yet as the budget is a bit tight, but from what I’ve seen, I love the different borders you can get as well as the fact that you can spell words and they line up perfectly, not like having to use individual block alpha stamps. Great blog candy! I like the Just Rite products for the ability to personalize everything. Congrats!!! I know that I stop by at least once per day. sometimes more often, because I need the great info whenever I am working on something!!! Your bon bon cookies look awesome. Guess I’ll have to add those to my baking list this month ðŸ˜‰ I can’t fathom one million hits — too many to count! Congratulations! Your work is way beyond inspiring. As for the Just Rite “best things” — I don’t own any yet, but certainly hope to very soon. I love seeing ALL the different things so many of you are doing with them — such versatility! What I like most about JustRite is the snap in gird and the variety of lettering and borders that are available to snap into the grids ! Thanks for a chance to win ! I think what I like most about the JustRite Products is using the small letter set to write anything you want so it is really personal. What appeals to me about JRS is the ability to say what I want to say with them! I love the just rite stamps and so thankful to you for the conditioning tips you provided, it helps sooooo much. I love the just rite products so much because of their versatility allowing you to personalize and customize your projects. I like how they have also really expanded the line. Thanks for the chance to win! Twelve new projects/ideas – ECK! I’m already behind and now more things I want to make – I can think of 100’s of uses for the Just Rite sets. I hope you choose me. Yours was the first (and still my favorite) blog that I follow religiously. Would love to ‘play’ at Janine’s site too today but her insturctions say you have to upload to your BLOG. Unfortunately I’m ‘blogless’. I’m glad to see that your site doesn’t have that requirement. Thanks again for the blog candy and all your wonderful ideas which have been copied and copied. Wow – those cookies look dangerous!! I have no self-control when it comes to cookies. Thanks for the chance to win and congrats on all your well deserved hits!! What a wonderful box & the cookies look num-yummy! I will try them out for this holiday season. Another great project, Sharon! I most like the ability to line up letters on the JustRite wood blocks to form my own words. It really helps to keep everything lined up nicely. Congrats on the blogging achievement!!!! Great cookie project too! My favorite thing about the JustRite stampers is the ability to personalize things. Growing up with a name like TESSA I NEVER had things with my name on them! I love being able to make things with the person’s name on them and they look GOOD all spaced evenly and neatly! so fun! I haven’t had the opportunity to use the JustRite stamps yet but everyone seems so excited about them. I am not good at lining things up well so the grid sounds fabulous to me! I love your blog!!! I have no Justrite stamps and would love to try them. I think what I would like about them is you can make your own words and sayings and they would line up perfect. Thanks for the chance. What a fun 12 days it is going to be. I can hardly wait to see what you and your team has in store for us. Thanks for the chance to win blog candy. I would love to be able to buy all that JustRite has. I think the stamps add that unique look to any project and to be able to add your own senitment by changing out letters is such a great idea! It is on my wish list so hopefully one of these days I will be able to get some, or maybe win one!! Oh my goodness! Those cookies look wonderful! Thanks for the two weeks of fun! My favorite thing about Just Rite is that you can make your gifts really personalized to the person you are giving it to. I think that makes it extra special since they know it esp for them with their name or monogram. Thanks Sharon for the chance to win some blog candy. I like the JustRite stamps because they carry the monograms. Another reason is that you only need one wooden stamp mount for all the letters. I just ordered the Just Rite stamper, using the 2/1 sale, and will use one for a gift for my daughter. I like the versatility it provides in the monograms, and also that I can use the borders with some tiny stamps for various seasonal occasions. Thank you for the chance to win the blog candy to go with this kit…what a present for whomever wins. ðŸ™‚ Happy Holidays! Loved your little bag and the cookies sound delicious. I think I will try making one using my scor pal. I have not used Justrite stampers, but would like to try them. Thank you for the opportunity to try and win them. Thank you for sharing your recipe for bon bons as well. What a fantastic blog candy! Your blog is always fun to explore, and is filled with great creations. I really enjoy using my Just Rite monogram stamper set. It allows me to add a special, personalized touch to any card I make! 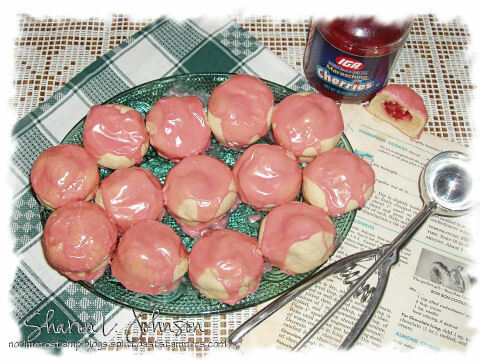 Oh, I will have to make those cookies – love anything with those cherries. And the recipe comes from someone in my own state! I love JustRite stampers becasue of the endless variety of word/quotes you can do. They are all you need! Yeah!! Congrats on your milestone. Your blog is one of my daily reads. I just used your “How to on Boxes” directions from Nov 12 for making little boxes last week for a secret santa project. What I love most about the Just-Rite products is the flexability – the ability to customize, make your own sayings, greetings, etc. I also enjoy the pre-made/coordinating designs and the variety of fonts. (I want them all!) I don’t have any of the rectangle stampers yet so I would be so psyched to win these. Thanks for the chance. Mmmm, those cookies look so good!! I love the JustRite products for all the customization possibilities. I have especially been eyeing the rectangle stamper for use with Bible verses, quotes, etc. CONGRATULATIONS SHARON!!!! For someone with no time to stamp you do alot of fabulous work and cookies to boot your my kinda gal!!!! I love the versatility of the Just Rite systems everything lines up so beautifully its fun to work with and so easy to be creative with. Heres to another milestone of hits on your blog!! I love Justrite stamps!! I must say my favorite thing would be the ability to write a sentiment inside a card using the rectangle wood blocks. Congrats on all your hits. your cookies look just yummy, will give them a try this holiday season. thanks for the chance to win some great blog candy. Just love those Justrite stamps. Wow! This sounds like lots of fun!!! Thank you Sharon for doing it or us!!! I like… no, I love your projects with Just Rite stamps! And all the days with challenges!!! Cookies’ recipes exchahge is very neat idea!!! Thank you to all of you my favorite crafters!!! I’ve never had the privilege to try the Just Rite stamps and I was wowed by the cute font and clever abilities. Can’t wait to try the cookie recipe, what a generous little bundle to share! I look forward to the 12 days, thanks!! What a great project. I think your bonbons look lovely. Must try them and your presentation is great (as usual). JustRite stamps is definitely on my wish list. I love the versatility of personalizing everything! No crooked sayings, great fonts, can’t wait to own one. Personalization is what it’s all about now. I love the versatility and easy of use of the JRS. I recently made monogrammed stationery for a friend of mind that just got married–it came out really nice. Thanks for the chance to win more JRS! Geezum Crackers!!! Sure looks like it’s going to be a really fun 12 days! I love how you all can take a blog & simple idea’s and your generosity & have people you don’t even know join in & end up with a really wonderful time!! thank you! The thing I like most about “Just Rite” is that I love it that I have the ability to customize gifts & cards to be “just right” for the person recieving it. I just got my very first Stamp Rite monogram set on Saturday so I can’t speak from much experience but I’m really impressed by what came in the box. The alphabet makes crisp, clear impressions and it’s easier than I expected to set up the stamper. I’d love to have more — so I wish me luck. This is awesome blog candy! I don’t own any Justrite stampers yet, but I guess the ability to stamp ANY saying that I want is the most appealing to me. It’s frustrating not to be able to find the perfect saying to compliment the card you spent lots of time making . With the Justrites you can say anything you want to complete the perfect card for any occasion. I hope to get some soon and winning my first set would be even more awesome! Thanks for the chance to win! Wowza you packed a whole lot into this entry today…lol. Thank you for the chance to win this awesome blog candy. Unfortunately for me I do not own and of the Just Rite products. I have seen so many awesome projects on other blogs and I am just amazed at the versitility of their products. I am putting some of these products on my holiday wish list and hope Santa will get the hint :-). Hope you have a great day and TFS. Oh my…I will HAVE to try that recipe. It looks incredible. I’m hungry now. Anyway…I think I like the versatility of the Just Rite products…the snap in grid is just awesome. I look forward to getting my hands on some someday! I love the versatility of the JR Stampers – you can personalize anything. I have the small letters set and use it quite a bit. Thanks for a chance to win this JR Stamper set and congrats on your blog hits!! I love the ability to create a personal saying to fit the gift occasion and to be customized for the recipient. I also like that a small image can be stamped inside of the circular saying further customizing the gift. Wow! I hope I can keep up for the next 12 days. Great candy! I love the ability to customize everything with JustRite products. I have never used the Just Rite stamps, but they seem to be very versatile…you can make any phrase you want and easily personalize a gift!!! I would love to try it. I’ve seen very beautiful cards make using Just Rite stamps!!!!! Wow, great project and great blog candy!!! It will be fun to see all the 12 days of Christmas….you are all so creative…..I love it!! thanks for the chance!! Your project is so adorable…and those cookies look yummy!!!! And what great candy you are giving away! I LOVE JustRite!!! I love being able to stamp whatever sentiment that you want…and to make monograms is so much fun! Thanks for the chance to win! You’ve just helped me make up my mind what I’ll be making for party favors this Saturday p.m……the favor bag filled with your cookies. How can anyone resist such treats. Thanks for sharing this idea. I don’t have any Just Rite equipment yet but have been loving all the card samples featuring it’s many uses. I believe the versatility of making so many different designs/patterns to fit the occasion is what I’m really attracted to. I know that I’ll be getting some soon. I love the versatility of the Just Rite products. You can create so much with these. The sky is the limit. I have not had the opportunity to try the Just Rite products. I have seen so many neat projects completed using Just Rite stamps that I can’t wait to get some of my very own. I love your site. Thanks for the chance to win. I haven’t tried JustRite yet, but the monograms and the circular borders hugely appeal to me! For me the biggest attraction to JustRite products is the fact that I am only limited by my imagination. I can make *anything* and put *any* word/phrase I want on it. LOVE that! Congrats on your huge blog accomplishment! Congratulations Sharon!!! Your blog is amazing and your ideas are always awesome. I don’t own any Just Rite Set, but I would love to create my own sentiments with it. Hi! Great stuff going on around here! I don’t have any Just Rite supplies, but I’d love to! I think what appeals to me most is being able to create my own sentiments! I like the different fonts that are right at your fingertips and the box to keep them all organized is a bonus. I’d love to be able to use all those fonts! I’m hoping that Santa will bring me some Just Rite! I love that they can be personalized to spell any name…who doesn’t like to see their own name on a card! Congrats on the 1000 posts! I love the fact that you can create any sentiment you want using the Just Rite stamps. I want to branch out into monograms as well. I don’t have any of the Just Rite stamps but I have been thinking about getting them. I like how you can make your own phrases and the different sizes. This would be the best Christmas present, if I could win! I would love the just right stamps.I would use them to add childrens names on birthday cards because kids love to see there names on the cards they recieve. I just order two sets of these stampers. I got a free one from the company years ago and so I saw these and loved them seems that everything you need it right there and hand. I can’t wait to get my hands on them to see if this is so. I don’t do cards i order the baking set so that I can use it for Christmas gifts. This has got to be a great deal to have it all handy and don’t dig for the little stamps. Wow, sounds like an exciting 12 days are ahead!! Love your project and the cookies look yummy. What I love about JustRite is the flexibility. You can customize anything and everything with ease! The rectangle blocks are not only great for customizing cards but also great for scrapbooking. Yummy! Your cookies look great, the treat bag does too! I like the idea of making monograms, and the ability to personalized all kinds of cards, tags, stationary, etc., with Stamp Rite. I’ve been wanting to get a Just Rite stamper for the longest time – probably this whole yr. But, I’ve been hesitant cuz I’m just not sure I’ll use it as much as I want to. But, I have to say that I Love the versatility of it w monograms to just perfectly fitting into the shapes of my punches and all the new things they keep adding to the line. I’m pretty sure it’ll be on my Xmas list this yr! ðŸ˜‰ Winning your blog candy would be a great way to start my collection! Thanks!! Sharon: I have never used anything from JustRite, but what really appeals to me is the fact that it would be so easy to combine fonts & sizes. That versitality alone is the calling card for me. Think Santa brings JustRite products? I’m hoping so! Congratulations on your magnificent milestone, Sharon. Glad to say I helped… I visit here all the time! I love your blog! I have been eying the JustRite monogram stamp sets for quite a while. I’m especially fond of the Curlz font and this is the only place I’ve ever seen that font available. I would enjoy making stationery and desk sets with it. All of the other features – especially the stackable storage – are gravy, but the thing I think I would value most, aside from getting a font I love already – is the chance to add other fonts to the set. Would love to win it, but if not, I definitely plan to buy it at some point. Wow – 12 fun filled days to look forward to. I am intrigued by the versatility of JustRite stamps. The fact that you can customize each set to ‘say’ whatever it is you want just thrills me. I love creating wedding/shower/party favors and with JustRite the options are endless. Thanks for the chance to win and thanks for the inspiration. I love the ability to “say” whatever I want with my JustRite stampers — and since I don’t own the Curlz font I would be thrilled to win it! Thanks for the great blog candy. I think the thing that is most appealing about JustRite is the ability to personalize virtually anything. I don’t currently have ANY of the JustRite products, but every time I see them on someone’s blog, I am more and more intrigued. I think the thing I like the most is the ability to create my own word, phrases, and sentiments for my cards or other projects. Some of my recent gifts have been monogramed stationary, but there are so many steps, that it would be easier to get it set up and stamp one SET at a time instead of one letter at a time. Thank you for the offer and double thank you for all of the sharing that you do on your blog. Versility comes to mind when thinking of what I like about JustRite. I currently have one of the monogramers which is great to make monogram cards and papers.. Also have the tiny letters which allow you to customize sayings around the circle and stamp a small image in the middle. The rectangle set gives you more versility so that you could create your own customized sayings… This is certainly on my wish list. Thanks for the chance to make my wish come true. This is my first time visiting your blog and it will not be the last as I’ve added you to my favorites. The Cookies look yummy! Loved the project! What I like about JustRite Stamps is the freedom to create your own sayings/stamps. It’s let’s you be the type setter! Congrats on your 1 Million mark! Wow! And thanks for all your marvelous tutorials! I like the flexibility of Just Rite stampers. And the mongrams and the fonts and ….just everything! I don’t have any of the Just Rite stamps and would love to own some . You work always inspires me Sharon and look forward to visiting your blog each day . Wow 12 fun days coming up !!!! I love how creative you can be with the Just Rite stamps. I thought they were just for monograms, but everone has shown me just how creative hou can be! I don’t own any of them, but would love to! I have been following all the projects on the different blogs that I read using the JustRite Stamps and, have to say, I would really love to have them. It is very difficult to line up traditional alphabet stamps with the precision that I like. Thanks for sharing the cookie recipe – they look yummy! Your little treat bag is so cute and the cookies look yummy. I love the ability to monogram with the Justrite stampers. I just got the mini letters too and I’m looking forward to being able to put whatever sentiment I want to around my monogram. The Harmony Rectangles were next on my list – thanks for a chance at winning them. Your cookies look delicious. I may give your recipe a try. I love the JustRite stamping system because it is easy to make monograms and to print exactly what you want to say. You can never find a stamp that will do that. Thanks for sharing. Im not fortunate enough to own any Justrite stamps yet so I can’t speak to their feel and ease of use, but I do like that fact that you can do monograms and just the sheer variety of products they offer is fabulous. I love how elegant, professional and clean looking all the completed projects are, that use these stamps. Thanks for the chance…what a great 12 days this is going to be!! I have some Justrite sets winging their way across the pond right now and I can’t wait for them to arrive to try them out. They look so versatile and I’m looking forward to making monogrammed gifts this Christmas. This is a wonderful giveaway!!! Thanks for the offer! What I love about Just Rite is the monograms! You can make such classy looking monogram cards with them! I am planning to make some for Christmas gifts for my SIL and Mom. Thanks for the chance to win the awesome blog candy! Such a cute project!!! I love the idea of being able to create monograms with the JustRite stamper. Thanks for the chance to win, and congrats on your great blog! Your projects are always sooo beautiful!! Love this little bag – I picture it holding so many fun things…cookies being just one of them:) Thank you for sharing the pattern. One of the things I enjoy making with the Just Rite stamps are specialized tags with either a name or special greeting – they are just so personal and I love that. In today’s world, common names are few – everyone wants their child to have a special name or spelling of a name. With Just Rite stamps, it’s so easy to personalize everything! Thanks for the opportunity to win some wonderful blog candy. I purchased my first JustRite stamper to do monograms. I love making personalized gifts. I have since purchased several more sets of the stampers and love them all. I really like the versatility. I also wanted to add that I enjoy your website alot. Love the ideas. i absolutely love my monogram set, but i would love to have a rectangular set, so that i can use longer names. you have some great candy. thanks for the opp. I love the monograms you can do with the JustRite stamps. Thanks for the chance to add to my JustRite collection! I love my JustRite sets because I can print whatever I want on a tag or a card. It’s easy to spell uncommon names, too. Don’t have the rectangular one yet, but it’s on my wish list. Thanks for the chance to win one. You are so sweet. Oh, I would love to win this blog candy, for sure. I do not have any Justrite and it looks like it would be fun and easy! Wow! What generous candy. Would love to try out these stampers. Being able to customize the words on a project is the thing that I find attracts me most. And I like the variety of fonts too. What appeals to me aout Justrite? The fact that I can say what I want! Thanks for a chance to win! I like the Just Rite products because they are so convenient and easy to set up. No guesswork. Put in your center and your font and go. So much fun! I love the fonts and the fact that everything is lined up “just rite”. I also love the frames. I love everything about them! And I sure do love your blog! I just received my first Just Rite stamp set, so haven’t had much time to play. I like being able to customize cards etc. to the person I am making it for. Would love to add to my set!! I love Just Rite monogram sets. They are easy to use and very versatile. What a cute bag and yummy looking cookies! Thanks for the chance to own some JustRite! I saw some in person, and I’ve been very tempted, mostly for the monograms and the fact the rim and letter fit together, no guess work as when stamping them each separately and trying to center a letter in a frame. I’m anxious to check out the rest of your site! Sharon I just wanted to say Congrats on your HUGEGANITC milestone….you are an amazing inspiration in more ways than one! I like the clean professional look of the just-rite mongram stamps. My favorite is the circle that you can put small letters around the edge. How clever – I love your projects. As for the JustRite products – I’m waiting for my first ever stamper to come but what appealed to me was the versatility of the stampers and the variety of fonts and centers available. Thanks so much for the chance to enter! my baking list just got a little longer. thanks for sharing. Wow! What yummy cookies! TFS your cute bag. Love the project!! Can’t wait to see the rest!! I love the versability of these stamps!! Thanks for all the inspiration!! So I’m new around here and love, love, love your blog! I also love Just Rite goodies and have some of the basics. But I love this Curlz font- would be perfect for just about everything I do for my daughter!!! She’s very much a girly girl and this set just screams “Girls Just Wanna Have Fuuu-uuun”! What I love about Just Rite stamps is how professional things look with their stamps. Not amateurish at all. Thanks for the chance to win and I love all the wonderful ideas that you have. Thanks! wowsers this is going to be some fun blog hopping! I love the Just Rite monogram ability as well as being able to make up your own sayings. Thanks so much for the chance to win some yummy candy! I think I love the most the ability to make my words all be in a row using the ribbed blocks- I say I think because I just ordered my first set(s) and can’t wait to play. I have printed out your tutorial on prepping the stamps and know that it is okay to trim the rubber. Once they arrive I am sure I will be back to your blog to get more ideas! Those cookies look scrumptious ! I will have to try those out. Love the bag too! Definitely the ability to do monograms! They look great! So do those cookies! Your Bon Bons look so yummy & so does your blog candy. I really need the Harmony piece. I want to personalize scripture verses. What fun the next 12 days will be!! Thanks Sharon for putting this together! Thanks for the chance to win some Blog Candy ðŸ™‚ I love the look of the Just Rite Monogram stamps and in fact, just ordered some of the Monograms with their special 2 FOR 1 Sale. I can’t wait to get them in my hands and try them out. Congratulations on your blog accomplishment Sharon! The one thing I enjoy most about the JustRite stamps is the ability to customize words around the monogrammed centers! That is one set I don’t have yet, but it looks like it would be so fun!! Congratulations! Nice job on your cookie project today too. I don’t have any of these stamps but would love to win some. I like the idea of being able to customize them. Wow! The next days sound like so much fun! The cookies look yummy..thanks for the recipe! Thanks for a chance to win some neat things! OK, I scanned through the first part to get to those incredibly scrumptious looking cookies – OH MY GOSH; they look heavenly!!!!! Meanwhile…thanks for the chance to win!! Congratulations! Love your blog and thorough instructions. Am just getting started with Just Rite products – lots of possibilities! The fact that I am about #299 for one post is amazing! Congrats on your SS party! I would love to have the Just Rite stamps for monograms. I’ve started doing some with, ummm, less quality stamps, and I can so tell the difference! I just love the Justright Stamps. I recently purchased 3 sets and I just love them. Love the little baggie. Yummy! These look good enough to eat even if they aren’t perfectly round like your mom’s! I don’t own any of the JustRite stamps – but I would LOVE too! I love the monograms and the way you can customize the greetings. How cool is that???? Thanks for all the great projects you provide. I love the bag idea; it’s perfect for gifts of love. Congrats on your blog success. The blog candy truly is…just right!!! I actually don’t have any justrite products yet, but I have a Christmas set coming in the mail, that should be here any day. I ordered it because I thought it would be versatile to have the one handle and numerous stamp rings. The mixing and matching thing looked amazing too. Thank you for the opportunity to win more Justrite. It really seems to be popular right now. I can’t wait to finally use them. Your cookies are making me drool! They look yummy! Harmony Rectangle Stampers seem like the perfect solution! I like the JustRite stampers for ease of use, great designs, and ability to personalize in so many different ways — font, color, style. Thanks for all the upcoming fun events! Oh, my mouth is watering looking at those Bon-Bon’s. Thanks for the recipe…gonna have to give it a try. The enabler for me with the JustRite stamps that I have are the versatility of making your own sayings/words/phrases. Can’t wait to see what else you have up your sleeve for surprises and eye candy! Those cookies look yummy; there goes my good intensions for the holidays! LOL. I would really, really, really love to win the JustRite blog candy but I don’t own any yet so I can only guess at what I’d love about them. From what I’ve seen, I think it would be great to just pop in the letters needed for my project and stamp a focal image perfectly every time! All of JustRite products look like fun! I’d love to win the blog candy because I haven’t had a chance to purchase any of the JustRite products. I would love to be able to personalize more things as easily as you can with all these things I see on your blog. You do great work, I might add!! I love your blog and the cookies look yummy!! Wth JustRite, the snap in grids are wonderful….I can customize it to say what I want!! wow those cookies look so yummy! The blog candy does too!! The feature I like most about the JustRite is the versatility. So many uses! Thanks so much for the chance to win! One Million… That’s so awesome! Congratulations! I only have a few JustRite stampers and I love them. They are perfect for monograms and personalized gifts. I love the ability to personalize and do monograms! I love the ability to do monograms. That’s what got me sucked in initially. However, I’d like to get the harmony rectangles after all the beautiful things you have shared. I love the curlz monogram set. it makes personalizing gifts so easy!!!! Your little box is adorable!! I love the pretty papers and wonderful tag!! Your treat look yummy as well!! Thanks for the recipe! Congrats on the 1 million mark – wow! I’ve never used the JustRite products (though I’m hoping Santa has gotten the hints I’ve been dropping!!) but what interests me most is monogramming. And that curlz font is just too cute! Your cookies look so good, I’m going to give your recipe a try. The Just Rite stamps would be great because you can get all the letters in a straight line. I don’t have any yet, but this is one reason I would get the stamp set. Congratulations on your 1 million mark. Awesome project and blog candy. and combine any sayings you want. Sharon, Congratulations on your HUGE milestone! You have inspired so many with your blog and creations! I love the ability to use whatever letters I need when I use Just Rite stamps. I have only one set, but I sure do love the flexibility! Those cookies look yummy! Thanks for sharing the recipe. I have never used Just-Rite stamps & I am confused by what you need to buy to get started. But I really like the look of the monograms. What a great post! BLog candy and a recipe too! I may try the recipe for cookies I need to make for my daughter’s youth group! THanks for sharing your BEAUTIFUL creations with us! Me again. I love the JustRite products for personalization! Projects look very professional, easily! Thanks again. I have been drooling over the JustRite products for months and LOVE the flexibility they over to customize projects. I haven’t been able to try them yet but hope to get some soon. Winning this candy would make my month! Congratulations Sharon on your blog milestone. I don’t any of the monogram stamps from Just Rite but I do own some of the individuals stamps. I do like the ability to do monograms. I love to make monogrammed note cards and this blog candy is so awesome. LOL Good thing I didn’t have time to do this challenge after all, ’cause that’s the same little bag I would have made for my cookies! This is so adorable, Sharon! 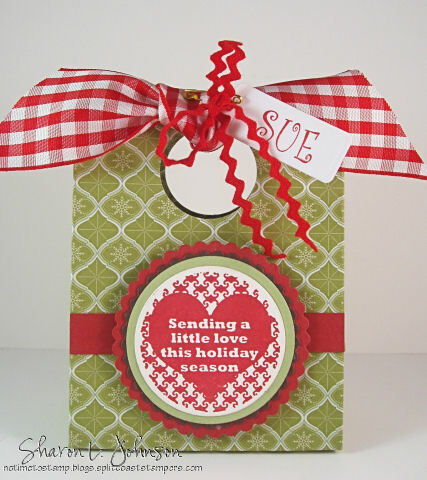 I love the brightness of the red and the gingham against that pretty shade of green! I’ll bet your sweet cookies look awesome in the bag, too! YUMMY! The cookies look scrumptious! Thank you for sharing the recipe, Sharon! Oh, the Justrite Stamps work so well! I really like the wooden handles as it is easy to get a good grip and a great image! The images available are so diverse, so that helps for most any occasion! WOW…what a great opportunity! I have been eyeing the JustRite stamps a lot lately and have even sent a link or two to my hubby for possible Christmas ideas for me. I make a lot of gifts and the monograms interest me the most! A Million hits!! That boggles the mind! Just shows that if you blog it, they will come!! Congrats on such a milestone! Just-Rite has to be the most versatile product I own! I have made cards to send and made cards to give as gifts and all from one stamp set. I made Christmas gifts for all the ladies in my Sunday School class with my one set! I love them! Would love even more to win a free set!!! Keep up the great work on your blog! Gives me a place to go and keeps me out of the stores! Congratulations on all the hits! You are an inspiration!! You have an exciting week planned for us. Thank You!! Would love to try them. Thanks for the chance to win some. Love that bag! The cookies look yummy! The thing that most appeals to me about just rite is they look easy. I haven’t tried them yet, but they look like a big time saver. Thanks for the chance to win! I love the clean and classic look of a monogram stamp. I just think it has so much elegance and any color works. Just endless possibilities. Great ideas here. Thaks for the inspiration. Love your project! I love the Just-Rite stampers. Thanks for the opportunity to win. I will have to try the cookies. Yum! Congrats Sharon! Very cute project and I can’t wait to see what you have planned for the upcoming days. I like the monograms for the abiltiy to create a speacial project and knowing that the letters are going to line up. What great candy!! Congratulations on all the hits! I’ve been dying to try to Just Right Stampers for the ease of monogramming things. I love all the clever ways you use their products. Thanks for the chance to win! Congrats Sharon…I love your blog, you inspire me greatly! I don’t have any Just Right Stamps, but have been admiring them, and it seems to me that they are so very versitile….your creativity can be endless with these. I am anxious to give them a try! Thanks for a chance to win! How much fun is this!!! I love Just Right stamps for the ability to monogram! I love all things monogram!!!! Thanks for the chance to add to my Just Right collection! I just love that Curlz font!! I am so inspired by these challenges – but I need to find a weight-watchers friendly cookie recipe! Thanks for all the ideas. I love your cute bag! Your cookies look delicious….I’m going to give those a try. I may put some white chocolate drizzled across the pink also….They are so fun…. Thanks for the opportunity at a chance to win the drawing. I love Just Rite stamps because I can do Monograms, and cute Labels for gifts, or Tags. But mostly I love them because it gives a polished look to something I’ve made, instead of working hard on a project and then attaching any old tag or write just anything in my own handwriting, I can use the stamps and have the polished finished look to my art. I love it!!! What yummy cookies and an adorable gift bag! I don’t own any JustRite stamps, but I would LOVE to! I’ve seen many amazing projects with them…and I really like it that they’re so versatile with different fonts and sizes. Thanks for this chance to win sweet candy! The recipe looks yummy! I love maraschino cherries, so will definitely give this a try! Your gift bag is great! I haven’t tried the JustRite products yet! Wow! What a wonderful gift! Thanks for giving us the opportunity! I just LOVE the versatility of customizing your sentiments and personalizing anything!! I am fascinated by the versatility of the Just Rite stamps – being able to customize what you say in the framed outlines. When you combine them with the Nestabilities, they make such an impressive impact on whatever they’re attached to. Please enable me by picking my name as your winner! I love the different fonts and how they snap together! I have the Just Rite little stampers and have love the versatility of them. Thanks in advance and hope the random generator picks me!!! I have the small round JustRite stamper and love it. I would really like to be entered into your drawing for a chance at the rectangular one. Thanks so much! By the way, those cookies look absolutely delicious. Yummy!! I just bought the JustRite monogram sets which lead to buying Nestabilities round scallops sets which lead to buying a Cuttlebug which leads to wanting to buy, buy, buy more!! LOL!! I think I just bought my own Christmas present! This would be a great addition to my new goodies!! Congrats and thanks for sharing the fun! As a Southern girl, I do love the monogram feature, but I think my favorite feature is the ability to make your own stamps with the snap-in grid. But, they have truly covered it all with the wonderful variety of fonts, all the different sizes, and, now, the expansion into different shapes. I just love JustRite! I LOVE your blog! Thanks for sharing your great talent with all of us! Congratulations! JustRite…I really love all the cool things that I am able to make with their products, but if I have to pick one thing that I really like about them is the number of fonts and the versatility I can get out of each one, I love alphas!! ustRiteâ€¦I really love all the cool things that I am able to make with their products, but if I have to pick one thing that I really like about them is the number of fonts and the versatility I can get out of each one, I love alphas!! I think what I like the most is the versatility and the option to make everything personalized. The stamps are also so elegant! The thing that appeals to me the most about JustRite are the ability to change monograms. I bought a stamp with my monogram on it but wanted to make cards, gifts, etc for others. Thanks for sharing the bon bons…they look devine! I love the Just Rite stamp systems… I like the way you can pick & choose what you want to display on a given “stamp”. I’ve never had a chance to try them so I would love to win the blog candy… thank you so much for the opportunity to play! I just got the Just Rite system and haven’t had a chance to try it out yet. However, the appealing feature to me is being able to make titles or words in a perfectly straight and perfectly spaced line. Yeah, no more measuring the spacing between each individual letter………. I love Just Rite Stampers because of the verstility they offer. With the alphabets available you can change your greeting to fit your card or the person you intend to send the card to. The Harmony Rectangle Stampers are intriguing…imagine what you could do with those. Thanks for the opportunity to win some great blog candy! Your cookies and packaging are so good looking! I will check out the sites and video later. I don’t have any of the Just Rite stamps or products but have been intriqued! I think the ability to customize the tags with my own words would be great. I have seen so many examples that so cute and useful. Plus I think I could figure out how to use it by looking at everyone’s stuff. They really look like fun to use. I wanted to take advantage of the sale they just had but could not find anyone who cared to share in the cost and my husband just gave me that stare when I asked it I could get some sets. Maybe it is more of a glare! Anyway, I should have just ordered them and been done with it but no, I decided to cave in and not get them. Thanks for letting me blab on and hopefully win some great stuff! Love your blog and all the creative examples. The snap in grids and the ability to spell out anything I want is what makes JustRite products so appealing. Their versatility is endless! I love the interchangability (is that a word?) of the justrite stamps. Sure would love to have the rectangle blocks and the font. Congrats on your milestone, Sharon. Keep the inspiration coming, we love it! The ability to do monograms is what first drew me to Justrite stamps. I just love doing monogram note cards in all types of fonts with pretty little borders! That’s the appeal for me with Just Rite Stampers! Sadly I don’t have any Just Rite Stampers as yet. I’m not sure how to get hold of them here in France. But will certainly have to look into it asap. They certainly look fun to use and having the chance to put in your very own messages/names etc. makes them potentially so versitle. The lovely wooden box that this font set comes in is sooo cute too. Thank you Sharon for offering such a lovely prize. I love the versatility of Justrite…the fact you can use the letters in the different types of blocks is fabulous. OMG! I love JustRite products! What appeals to me is the ability to interchange the parts. What I love about JustRite is the ability to make any message I want, so I’m not limited to the sayings that I own. I love the versatility of the stamps. Being able to create unique monograms to personalize any project is especially appealing to me. I love those little tiny letters that let you personalize a monogram, say for a graduation, with the year and the school. So cute! Thanks for the celebration and the chance to win, and congratulations! I love the ability to cutomize your sentiments! Thanks for the chance to play! I have the round JustRite. I love it because you can use different font combinations and make your own phrases. I would love to own the rectangle. I have seen really neat projects using the rectangle. Thanks for the chance to win it. I love all your projects with instructions! wow…this is so exciting!!! what appeals to me most about just right stamps is the ability to customize any sentiment you want! love that idea!!! What I like the most about JustRite stamps is the ability to change fonts and the sentiments to match the card you working on. Love the cookie bag. Just Rite stamps – love the flexibility of use and the polished look you get with them. Awesome blog candy! I think what appeals to me is how easy they are to stamp with. The grid lines make your letters straight and you can adjust them easily. I have the round wood blocks and they work great. I would love to add the bigger ones to my collection! I love how quickly I can personalize a card or gift set to give the receiver that “made just for me” feeling. I have 2 sets, and love playing with them! Thank you, hope I win. I am new to just right, I only have one set the curlz, I LOVE LOVE IT!! its so very easy to make lots of quick notes, cards, or gift sets!! I would LOVE to win more Just right!! i like the justrite system because it allows me to make choices. the mix-and-match feature lets me pick out the designs and letters/words that i want for each project. The cookies look very good and the bag is awesome. I am making some up for my baking goods and I believe this one I am going to try. Thank you for the ideas. Those cookies are so tempting I feel like plucking them right off your blog! Cute cookie gift bag as well! My favorite part about the Justrite stampers is the ability to switch our borders and letters to make monograms, tags, or embellishments! Love those wooden holders too! What do I love most about Justrite products?? Where do I begin! I have some of the pre-inked word stamps and they are so handy to grab for small projects. I’ve been craving the larger sets for making monograms and notecards! Love the versatility and the easy-to-use aspect of them. There are so many features of the JustRite Stamps that I love. The thing that I love the most is that they are very versatile. You can customize them to anything you want. I look forward to adding to my small collections. The fonts look great. I haven’t personally had a chance to touch them yet. If I win, I’ll let you know if I like anything else about them. ðŸ™‚ I’m sure I will. I have never used any Just Rite products. I do think that the various font choices is great! Thank you for offering these interesting stamps!! I love the versatility of the Just Rite projects — SO easy to make monogrammed/personalized gifts for ANYONE! I love to monogram! I also love the sets for recipes and candy. I also love the ideas on the web site. I love the ability to switch out the borders on JustRite stamps, as well as the grid to make up my own sentiments. The party looks exciting – thanks for the chance to win! This post is now closed for BLOG CANDY ENTRIES. The winner will be selected and announced later tonight after I get my tonight’s post up. THANK YOU ONE AND ALL FOR PLAYING — MUCH APPRECIATED!! !